Jessica Cook recently received one of the OHSAA/SEDAB Scholarship. Cook is pictured with Jerry Snodgrass (OHSAA Executive Director) and Stephanie Evans (representing the SEDAB). In conjunction with the Ohio High School Athletic Association, the Southeast District Athletic Board hosted its annual Scholar-Athlete Banquet on Thursday at Ponderosa in Jackson. Pictured are the OHSAA/Ohio Interscholastic Athletic Administrators Association Scholar-Athlete recipients that were present. Pictured are, seated from left, Abby Howard (Alexander), Camryn Chandler (Piketon), Matthew Mangus (Leesburg Fairfield), Bailey Ward (Oak Hill), Tojzae Reams (Belpre), Shelby Ward (Logan Elm) and Katie Osburn (Belpre); standing from left, Martin Benencia Courreges (Athens), Bailey Sprague (Belpre), Ohio High School Athletic Association Assistant Commissioner Jerry Snodgrass, Cecil Fletcher (Chesapeake), Brooke Webb (Chesapeake) and Jessica Cook (Meigs Eastern). Absent when the photo was taken were Peter Buckley (Athens), Sidney Fick (Nelsonville-York), Luke Hanson (Sheridan), Avery Harper (North Adams), Clayton Howell (Waverly), Nicholas Kudlapur (Logan), Garrett Maiden (Nelsonville-York), Keifer Mosmeier (Logan Elm), Michael Norris (Alexander), Ellie Ruby (Wheelersburg), Seth Russell (New Lexington), Matthew Seas (Peebles), Alexandria Smith (Portsmouth Notre Dame) and Christopher Staten (Fairland). JACKSON — The Ohio High School Athletic Association annually provides scholarships for outstanding student athletes from its member schools. Each member high school may submit one senior male and one senior female candidate for scholarship consideration. Each member high school may also submit one senior female minority and one senior male minority candidate. The scholarships are awarded to student-athletes who have excelled in the classroom as well as high school sports. At the state level, the OHSAA provides 48 scholarships across the six OHSAA athletic districts. 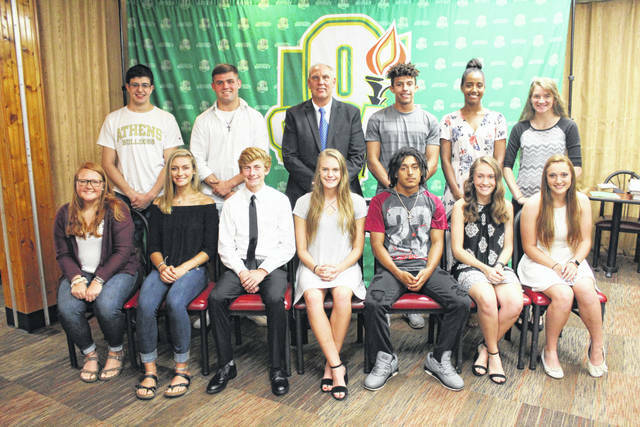 Thirty-six students receive $1,000 awards – including one student from each of the six OHSAA athletic districts that will receive an Ethnic Minority Scholarship – the remaining scholarships are awarded proportionately according to the number of schools in each athletic district. In addition to the four scholarships awarded by the Ohio High School Athletic Association the Southeast District Athletic Board (SEDAB) is proud to award an additional 21 scholarships to the deserving scholar-athletes in Southeast Ohio. In conjunction with the OHSAA the SEDAB recently announced the 2018 Scholar-Athlete Scholarship awards at their annual Scholar-Athlete Banquet on June 21, in Jackson, Ohio. The SEDAB is pleased to announce Jessica Cook of Eastern High School has been awarded the SEDAB Scholarship in the amount of $500. Jessica plans to enroll at Shawnee State University in the fall and study nursing. https://www.mydailysentinel.com/wp-content/uploads/sites/14/2018/07/web1_7.3-Cook-1_ne201873121137648.jpgJessica Cook recently received one of the OHSAA/SEDAB Scholarship. 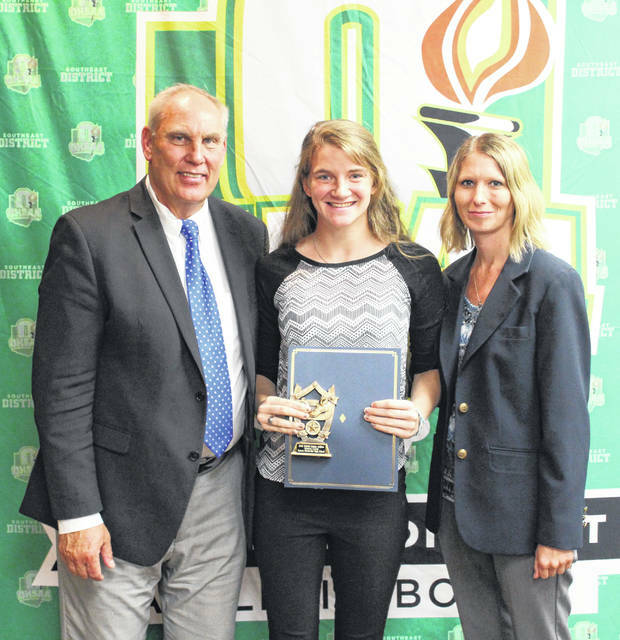 Cook is pictured with Jerry Snodgrass (OHSAA Executive Director) and Stephanie Evans (representing the SEDAB). https://www.mydailysentinel.com/wp-content/uploads/sites/14/2018/07/web1_7.3-Cook-2_ne201873121147809.jpgIn conjunction with the Ohio High School Athletic Association, the Southeast District Athletic Board hosted its annual Scholar-Athlete Banquet on Thursday at Ponderosa in Jackson. Pictured are the OHSAA/Ohio Interscholastic Athletic Administrators Association Scholar-Athlete recipients that were present. Pictured are, seated from left, Abby Howard (Alexander), Camryn Chandler (Piketon), Matthew Mangus (Leesburg Fairfield), Bailey Ward (Oak Hill), Tojzae Reams (Belpre), Shelby Ward (Logan Elm) and Katie Osburn (Belpre); standing from left, Martin Benencia Courreges (Athens), Bailey Sprague (Belpre), Ohio High School Athletic Association Assistant Commissioner Jerry Snodgrass, Cecil Fletcher (Chesapeake), Brooke Webb (Chesapeake) and Jessica Cook (Meigs Eastern). Absent when the photo was taken were Peter Buckley (Athens), Sidney Fick (Nelsonville-York), Luke Hanson (Sheridan), Avery Harper (North Adams), Clayton Howell (Waverly), Nicholas Kudlapur (Logan), Garrett Maiden (Nelsonville-York), Keifer Mosmeier (Logan Elm), Michael Norris (Alexander), Ellie Ruby (Wheelersburg), Seth Russell (New Lexington), Matthew Seas (Peebles), Alexandria Smith (Portsmouth Notre Dame) and Christopher Staten (Fairland).